That was Santa’s surprise present this Christmas: a really nice Nikon SLR, the F-501 AF. It is a thirty-year-old camera (1986, just like me) mixing vintage looks and a nostalgia bonus (just like me) in a body that is quite heavy (just like… nevermind) but is also offering a firm and steady grip. More importantly: the F-501 AF is the first customer grade Nikon SLR to offer a modern TTL (Through The Lens) autofocus system. It was sold in the US under the N2020 AF denomination. Former systems in the same grade of cameras used specific lenses containing the focus motor. High prices led makers, first of them Minolta one year before the F-501, to build their motors inside the body of their SLR. Twist of fate, modern DSLR would switch back to motorized lenses once prices go down, for efficiency and low volume requirements. Good to know: the batteries required to run this camera are 4 simple AAA cells, located on a support in the shoe. Easy to find, including rechargeable models (planet Earth will thank you). The first customer grade SLR by Nikon. Another then-new feature, the F-501 has automatic film advance, thus the absence of winding lever. This also eases film loading, and sensibility is automatically set thanks to DX code reading on the roll. As always in photography, improvements come one at a time, and the advance motor does not provide rewind capability. Along with the camera debuted the AF Nikkor lenses, still sold today! I’ve been spoiled with two of the standard lenses, the 50mm f/1.8 lens and the 35-70mm f/3.3-4.5 zoom. The latter seems to receive mixed reviews and I do not have tested it yet. I grabbed the 50mm first, and that was the best choice: it’s a renowned lens, bright and precise, producing a really nice bokeh. Nikkor AF 50mm f/1.8 : it’s a renowned lens, bright and precise, producing a really nice bokeh. It was really easy to get my hands on and use this camera. I grabbed it naturally on a couple of occasions for a test roll, without ever thinking about the light conditions or anything. On sunny days as well as evening light, it’s been really confortable to use. The firm grip and steady shutter even allowed some twilight shots without much motion blur. F-501 controls. A tiny speaker has fun firing high pitched beeps on various situations. Hopefully it can be turned off. Film rewind is manual, but film sensibility is automatically set. The F-501 offers exposure compensation. AE-L and AF-L functions are misplaced and hardly distinguishable. Autofocus can be switched off. Active, it can be either one-time or continuous. The AF Nikkor 50mm f/1.8 is marvellous. Automatic exposure modes are CPU controlled with preference for high or low speeds. The aperture priority mode will be your best friend. Manual exposure will allow to shoot using compatible lens. Only speed priority mode may be missed by its admirers. Some ergonomic oddities can be forgiven: the power-on switch has a tendency to remain in-between two modes, the AF-L and AE-L buttons are unreachable. The viewfinder is bright. On its right, the selected speed is displayed, along with an exposure guide when necessary. However, it is missing a reminder of the corresponding aperture, like on the Canon A-1 SLR. This is something you can be accustomed to. Below the image, there is a focusing guide, displaying the direction you should manoeuvre your lens barrel: useful when in manual focus! In low light situations, the autofocus system performance is disappointing. Because in low light situations, the autofocus performances is disappointing, and you can then sense the giant steps the makers have made to get to modern autofocus systems. When the autofocus system does not manage to focus properly, the focus guide is not of a big help, and the standard focusing screen does not offer any clue useful to manual focus. An optional focusing screen, Type J, is the only hope of getting support from microprisms. Everything in balance, the F-501 is a very good SLR camera for making good use of the excellent compatible lenses. Here is a galery of some shots from the test roll: Ilford HP5 Plus at 400 ASA. Every picture has been shot using the AF Nikkor 50mm f/1.8 lens. Low light situations are easily handled, only if you manage correct focus. Do not hesitate to ask in the comments if you have questions about the Nikon F-501 AF, and please share your pictures shot using this camera with me on Instagram. Have fun ! Thanks Mike, I found that amusing! Interesting that we agree on many points too. 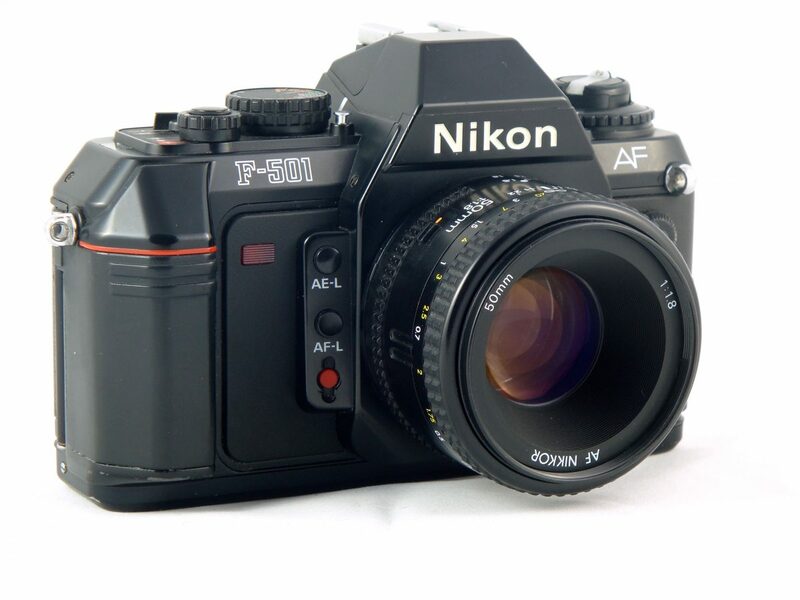 Can I ask, I just bought nikon f-501 in great condition on eBay. And I would like some low profile “pancake” lens for it. Is there any with AF support? I’m not familiar with low profile lenses, but I’m pretty sure they exist in F-mount with manual focus. Unfortunately, I’m not aware of an AF version. I checked mine right now and it does exactly this when there is no film inside. Even autofocus is switched off. When I open the back door to reset the frame counter, the camera let me focus and shoot the 4 initial pictures (all at once). It then realizes there is no film loaded, and it goes back into “no response” mode. If you have film in it, maybe it is not correctly attached to the right spool. The user manual also states that the LED should blink if you load film that does not have a DX code (silver squares on the film canister) and left the ISO selector on “DX” position. I am attempting to use the N2020/F501 in manual mode, I am trying to understand what the flashing numbers are telling me from an exposure setting point of view. How i can tell when i am underexposing by a stop or over exposing. The flashing numbers are warning of under/over exposure once there is on stationary number the exposure is correct this is in manual mode or under arrows if the shutter range is above 2000 sec or the lower than 1 sec either stop down for over exposure or use flash lower than 1 sec ( unless you are on a tripod lower than hand held permits or B setting Rule of the thumb is to use a shutter speed that is the same as the focal length for sharp images.